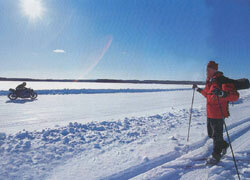 To you understand "Why Iceroadracing" I now want you to read the Safety page, Handling and Limit page first. It depends on who you are of cause and what you want to achieve bye coming here! Iceroadracing works for anyone from world roadracing champion to absolute street bike beginneTo you understand "Why Iceroadracing" I now r, and let me explain why. I think the videos and photos explain it all with one word "fun" or bloody fun. I have raced in top level supersport and tried 330 bhp turbo bikes in 340 km/h, but a wild rear wheel slide on ice out from a corner with the front wheel up in the air in 140 km/h after only 2 laps....,you have to try it before believing it. Even a motorcycle beginner will learn fast and in 2 days of practice you can do some sliding and do a power wheelie, others do after 3 laps. Iceroadracing comparing to road racing is: safer, the bike tells you early where the limit is, in a days you learn to control and slide a superbike, and that's why it is so fun.
. due to motocross riding or pre season testing for example. 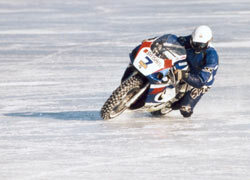 I also know that the only training some rider's get is during the teams pre season tests of the bikes. According to scientists in the airforce You get the best training by practice something that is as equal as possible to roadracing, but even better if you can make the training more extreme. That's why the Airforce pilots have simulators and I invented Iceroadracing to get an effective training to less risk. 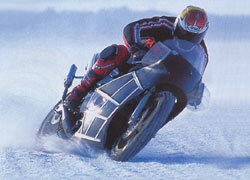 In Iceroadracing you can practice effectively with your racebike, but in a safer environment. 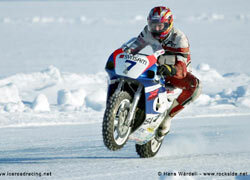 (read safety page) and (sliding page) My question is: Why practice a different, ineffective and dangerous sport for a roadracing pilot when we now have Iceroadracing?. Becide Iceroadracing I can put together a mixed program that fit's you with wintersports and with some help from local world class physical and mental trainers. And use the physical / mental-stress training simulator (Maximental) in the gym that I also developed for the camp. You don't need to bee a GP rider to come here!